We use our more than 30 years of experience and our extensive industry expertise to develop product solutions for soundproofing and insulation. Our experienced specialists and modern machinery enable us to develop customer-specific solutions and to flexibly manufacture small and large series before offering them in line with market standards and supplying them according to our customers' needs. When it comes to our product solutions, the potential areas of application are virtually unlimited. Our abundance of experience and technical expertise enable us to meet our customers' individual demands. Our innovative insulating materials effectively absorb disturbing environmental influences and are perfectly tailored to suit each specific application. Our main objective is to consistently further develop innovative insulating materials and make them suitable for use in a wide variety of different areas of application. PLASTOCELL's main area of expertise is the production of insulating materials that make day-to-day life more pleasant. We use our more than 30 years of experience in the development and production of insulation products to meet top quality standards. Be it on the bus, in trains, on ships or as insulation for entire groups of buildings, our soundproofing and thermal-insulation solutions never fail to impress both manufacturers and users. If you're looking for standard or customised production, our wide range of products configured to suit your individual needs are sure to tick all the boxes. Our insulating materials help to provide more efficiency and a better quality of life. 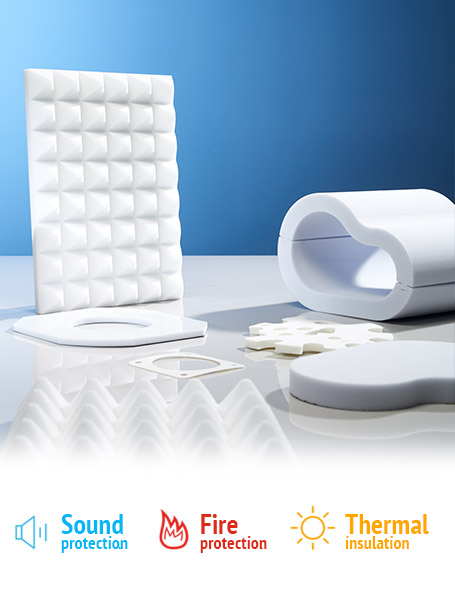 They effectively absorb disturbing environmental influences and help to reduce mechanical, thermal and acoustic loads. Our products play a multifaceted role in helping to absorb noise as a source of stress and thus offer users a better quality of life. How? By making noise quieter.